Frankie and Bennies Westwood Cross, your staff need to learn to smile! On Monday we met with my friends Emma and Shawn and their children, Elliot (2) and Adam (4m) with Emily for lunch. It was a great opportunity for Sam to finally meet Emma and the family and vice versa after talking about one another for past 3 months. 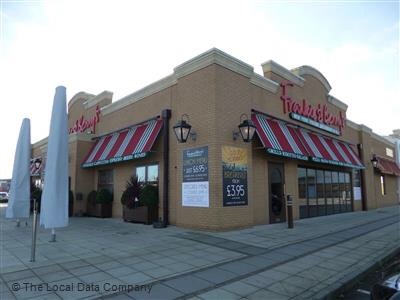 Frankie and Bennies, the Italian American restaurant on Margate road in Westwood cross Thanet, was our choice of venue. Thankfully due to the 4 adults having 3 children under 2 with us, I’m really pleased I called up and booked ahead as bank holiday Monday was a nightmare. Quiet one minute, heaving the next. F&B’s offer a fab lunchtime deal where lunch starts from just £6.95 which was available on a bank holiday, perfect for the new year and for bank balances all round. Adults menu: Available Monday – Friday, 11am until 5.30pm, including bank holidays, you can get good bang for your buck choosing from their great value lunch pack that has over 20 dishes to choose from. Each main course is £6.95 and you can add a starter of dessert for just £2.50- including unlimited refills of Pepsi, Diet Pepsi, R Whites Lemonade or Tango Orange when you buy a regular drink for an additional £2.75! Mains include American hot pizza, spaghetti meatballs, BBQ chicken wraps and more. Me: bacon & cheese hamburger and fries followed by the waffle & ice cream dessert shared with Sam. For 3 alcoholic drinks and 4 & 1/2 people eating, £69 is really cheap for affordable family favourites. Will we be coming again? Probably not. As much as the food was nice, there was not enough staff to deal with the increasing numbers of families piling through the doors, the service was slow, the staff looked fed up, orders were taken but slow on return to table, the place was incredibly messy, loud and bloody hot which resulted in Emily and Adam crying in chorus with each other. For Sam and Shawn the portion sizes were a little too small but they suited Emma & I, the place wasn’t big enough to accommodate for the streams for families flooding through the door between 12-3 and overall if you don’t like feeling claustrophobic this would have been your idea of hell. I can’t say personally I’ll be rushing back during school holidays that’s for sure.